This week's theme was inspired by Employee Appreciation Day which is March 2nd. The terms employee appreciation and employee recognition are often used interchangeably but they are actually two different things. Employee recognition involves acknowledging an employee's job anniversary, quality of work and their positive contribution to their workplace environment. Employee appreciation is a little more personal - it's about making meaningful connections with your employees, like knowing (and sending cards on) their birthday, knowing their special interests such as hobbies or community/charity interests they support, and any other information they are willing to share that can personalize the employer/employee relationship. Celebrate Milestones. 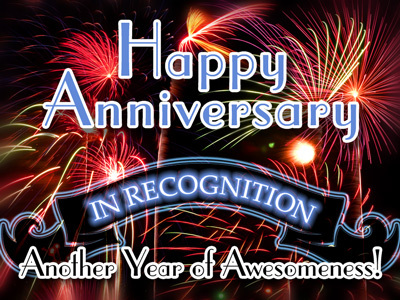 A popular form of employee recognition is to send eCards to employees on their work anniversary but don't forget that you can celebrate more than once a year. You can congratulate employees when they complete projects, get a promotion or complete some other important milestone. Everyone likes to feel like they are a part of something; so regularly keeping in touch with employees to show their positive progress can inspire them to take that next step forward with your company towards the next milestone. Feature the Positive Attributes of your Employees. Everyone recognizes the phrase "Employee of the Month" but there may be value in recognizing people on more than just a monthly basis which is only 12 employees a year. Many companies will highlight standout employees in a newsletter or staff meeting and sometimes it's often the same person or group of people that get highlighted. Here's a new and different approach. Each week, randomly select an employee and put together an announcement of that employee's contributions to your department or company. Recognize them for something that is their strength - maybe they make the workplace environment happier, have the highest sales or are the first person people to go to when they need help. There is something positive in each and every employee. An employee may even be flattered that someone recognized an attribute in them that they might not even know they had or knew they had but felt it went un-noticed. When someone feels appreciated, it is highly probable that they will be more confident as they move forward in their position. Share Compliments. Whether it's a customer or a management compliment about an employee, it should be shared. The person being recognized will feel good, but it is also important that other employees see an example of what they can do to perform better. A little bit of competition can be healthy. Birthday Cards. One of the easiest and most popular forms of employee appreciation is sending birthday cards to your employees. It can be a printed card or it can be electronic. What's important is to show them that you remembered them on their special day. Depending on your company policies, you may wish to institute a program where you post people's birthdays so other people know, and can wish them a happy day as well. Boost Employee Morale with a Fun Day. I like to think of this idea as akin to a school field trip. Most students love field trips because it's a day off from school work and they get to spend time relaxing with friends. This same concept can be applied to the workplace. You can choose something educational or related to your business but one of the best ways to choose an activity is to find out your employees favorite activities. You may even find that several employees have the same favorite activity and they didn't even know it about each other. For example: if several of your employees like gardening, you could have a company field trip to help build a community garden. It's a good bonding experience and for the employees who may never have done the activity before, they may find a new hobby they really like. Make sure you take lots of pictures and share them so employees can remember the fun day they had. Employee Surveys Show You Care. From finding out what activities employees like doing in their free time to what can better help them in the workplace, surveys are an invaluable tool for keeping in touch with your employee's needs. Do they have the tools necessary to complete their tasks? Do they have an organization they are passionate about? For example, if your company offers contribution matching, then you may consider reminding them in an eCard. If there are organizations that your employees regularly volunteer their time with, recognizing those accomplishments to co-workers is a great way to show your company cares about your employee's efforts. Getting to know what is important to your employees and helping them to achieve their goals is really what employee appreciation is all about. Employee Appreciation Day is a great reason to acknowledge your employees' contributions; but it's important to look at employee appreciation and recognition as a year-round endeavor, not just one day. That's why this week's newsletter looks at ways to recognize and appreciate your employees throughout the year. Daylight Saving Time is Sunday, March 11th so we have chosen "Saving Time" as our next weekly theme. Since Time = Money, we figure everyone will appreciate ways to automate tasks and save time.